One thing I didn't like about 2011 was the drop in quality of good insightful surveys and studies. Like all the infographic, most surveys seemed to have been made primarily to attract page views and not to tell you anything useful. 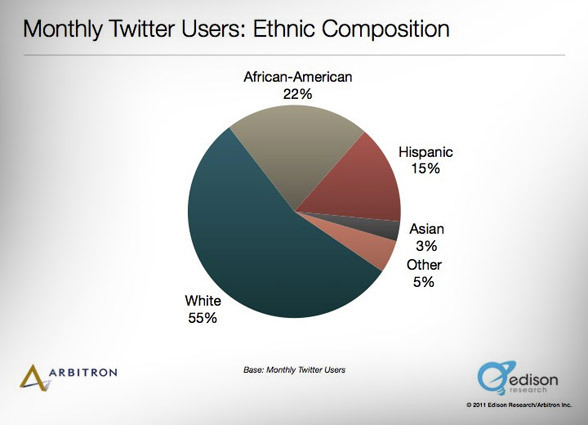 Arbitron and Edison Research looked at the ethnic composition of people using Twitter in the US and released this graph, and you might think this is interesting to see that Twitter is so diverse. But then you have to ask, what is the ethnic composition of the US population? And when you look that up, you get something like the graph below. 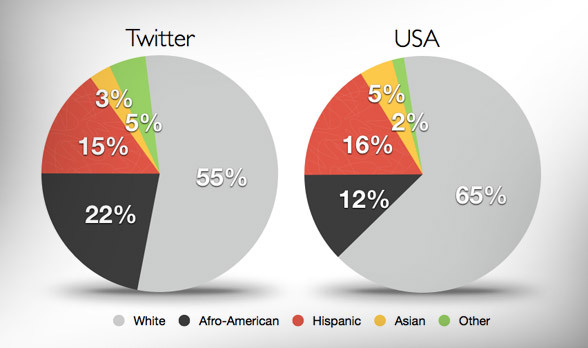 Suddenly you find that the ethnic composition of Twitter's user in the US is pretty much the same as the ethnic composition of USA as a country. ...or to put it in another way, this study revealed nothing. The slight difference in numbers could easily be explained by statistical insignificance and difference in survey groups. What they found was that people in the US use Twitter. And you have to ask yourself, why did they even ask this question? Black people don't decide to use Twitter because they are black, just as white people don't decide to use Twitter because they are white. You use the tools your friends and influencers use. Social media use is not caused by race. The color of your skin or the birthplace of your great-great-grandfather is completely irrelevant. If you are brand why even focus on this? You should spend your time more wisely and focus on where your customers are - whoever they are. What they found was the Facebook is bigger than the other social networks, and since people are doing pretty much the same thing everywhere, Facebook is, overall, a bigger influencer. We knew that already, they didn't find anything new. And, you can't look at social networks as a whole, because that is like surveying what power company people use (surprise, people dominantly use the dominant provider). You have to look at specific elements. For instance: Is the purchasing power higher per follower on Facebook vs. Twitter ...and why is that? 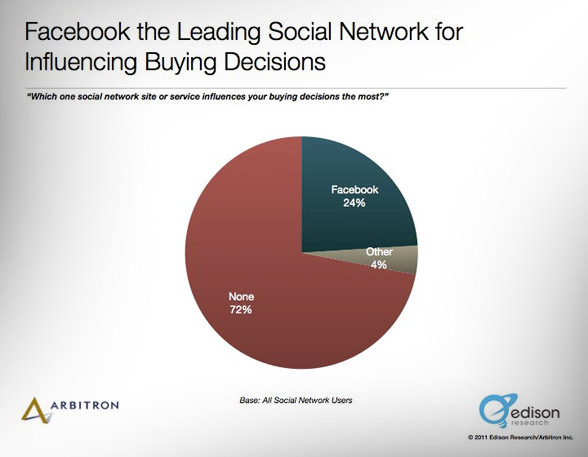 Oh ...and the biggest influencer is not Facebook, it is "None". Because the whole question is quite strange. Facebook is a platform. Your actual influence is not caused by Facebook. It is caused by what people do on it. In 2011 we saw a ton of studies like these. They were filled with data but with little or no value. Studies that look at a narrow area of new media, attributing significance to what they specifically measured with complete disregard to other factors that heavily influence the numbers (like with the ethnic composition graph). I predict this phenomenon will continue and even grow in 2012, because it is a great way to create link-baiting while, at the same time, make something that appears important. Let us focus in 2012 on data that really matters. Stop wasting your time on studies that tell that the Earth is round and rotating. Focus on studies that provide real value. Studies that identify real change, and focus on relevance. 2012 is going to be the year of noise (we cannot change that because too many people are focusing on page views and short-term exposure). But let's make a pact between you and me and make it the year of relevance.